Aspen is known for offering the pinnacle of vacation home rentals; from dining to shopping, spa experiences to Aspen vacation homes, travelers to Aspen expect nothing less than the best. At Snowmass Vacations formerly First Choice Properties, our Aspen vacation homes will not disappoint. You’ll find the perfect vacation rentals for your next stay in Aspen Colorado and be treated to unsurpassed location & amenities. Snowmass Vacations offers a selection of Aspen vacation homes for rent that boast fireplaces, WiFi service, hot tubs, and custom décor. If a vacation home isn't quite what you are looking for, make sure to check out one of our Snowmass Condos for your next vacation. Enjoy a stay in exquisite surroundings, the way an vacation in Aspen was meant to be. This newly remodeled Villas of Aspen townhome is idyllically nestled between all four ski areas and only minutes from downtown Aspen, making it one of the most coveted locations in the area. A five-minute drive will deliver you downtown where you’ll find all the shopping, dining, nightlife and resort activities that Aspen is known for. This vacation retreat offers guests who choose to bring a car the convenience of a private parking spot just steps from the home, or travelers can choose to walk down the short wooded pathway to the bus stop and hop on the free bus for easy access to all the area has to offer. For the guest who would like to do and see it all, each of the area’s four world renown resorts are only a short drive away. The epitome of mountain homes, guests are welcomed by an open floor plan highlighted by streaming natural light. The kitchen is a gourmand’s dream with high end appliances, a wine cooler, and natural stone counter tops. The open floor plan allows guests in the kitchen to enjoy the company of guests in the dining and living areas. The dining table is set in a sunny alcove surrounded by windows all around. 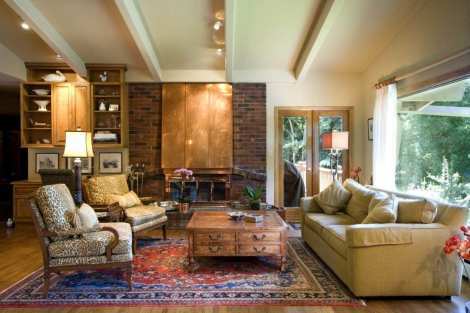 Enter the living area and find cozy furnishings, a gas fireplace and rustic wood beam accents. 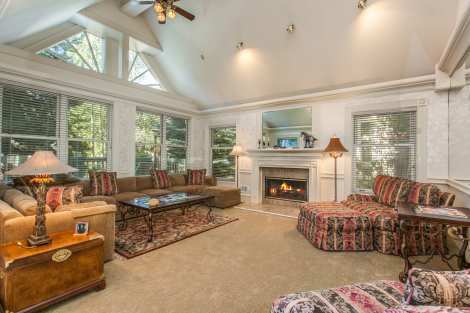 Mountain chic décor can be found throughout the home from the living spaces to the 3-bedrooms. The master suite and second bedroom upstairs both boast comfortable sitting areas. Along with the third bedroom downstairs, you’ll find ample room for up to 8 guests. Step outside to your private patio and enjoy the lush alpine surroundings on a sunny day. Guests also enjoy the convenience of a washer/dryer and WiFi. Nothing is left to be desired in this contemporary Aspen retreat.